Robometricschool. - This is information to you about microcontroller news in this time. This is article with the title with Great Cow BASIC Is Your Alternative to Programming PIC Chips in “C that wrote by Don Wilcher. Microchip PIC chip applications have traditionally been programmed using the MPLAB or MPLABX Integrated Development Environment (IDE) development tools. These coding tools allow hardware engineers to build embedded devices concepts quite effectively. Electrical engineers, especially, have grown accustomed to building their embedded software using variations of the ANSI C programming language known as Embedded C.
The Embedded C language variations is based on the microcontroller manufacturer's architecture and specifications of the device's GPIO (General Purpose Input/Output) ports, timers, counters, and SFRs (Special Functions Registers). But I recently discovered an alternative coding language that is easy to learn and can program PIC chips as effectively as Embedded C.
For those Design News readers who are familiar with Beginner's All-purpose Symbolic Instruction Code (BASIC), PIC chips can now be programmed using this coding language. 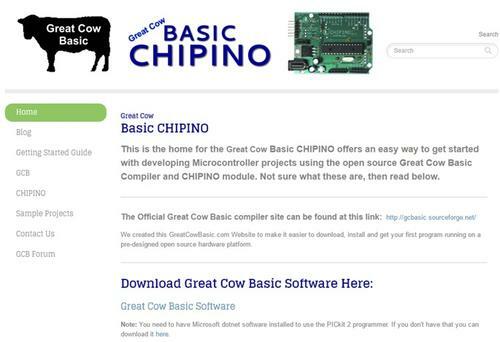 Great Cow Basic (GCB) allows Microchip PIC chips to be programmed easily using this alternative programming language. The learning curve for GCB is quite small, therefore allowing you to build your embedded device software within several minutes. To illustrate the ease in which to build an embedded device, I'll present my PIC chip-SNAP Circuit LED Flasher as the example:. Read more here.